ATTENTION CHARLOTTE TENNIS PLAYERS, PROFESSIONALS AND ENTHUSIASTS!!! The CTA continues to work closely with MCPR and is very excited about their efforts towards enhancements for tennis programming in the park venues, including this public assessment related to current operations, policies and procedures. Additionally, as a continuation of the MCPR Master Plan process, the CTA has maintained communications with MCPR regarding the concept for a community tennis facility. The CTA Board of Directors encourage you to attend one or more of the upcoming community workshops, at a location/time that is most convenient for you. These workshops are open to all and are scheduled for September 23, October 5, and October 21. Following a general presentation on tennis court operations, programming and facilities, facilitated group discussions will be used to explore key topics of interest to the community. While it is especially important that current public court users participate, all tennis players, tennis professionals and enthusiasts stand to benefit from the outcome of these meetings. Please feel free to contact Charlotte Tennis Association Executive Director, Carla O'Connor (carla@charlottetennisassociation.com), with any questions. Did you know that tennis is the fastest growing traditional sport in America, with a 43% growth since 2000? Did you know that youth racquet sales are up 88% since 2003 and adult racquet sales are up 30% for the same time period? Did you know that 27 million Americans played tennis in 2008, and 6 million tried tennis for the first time? Did you know that the CTA boasts the largest USTA League program in NC with almost 7,000 participants and growth of over 40% since 2004? 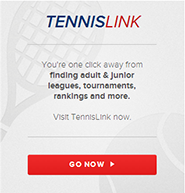 Did you know that the CTA boast the largest USTA Jr. Team Tennis program in NC, and the second largest in the USTA Southern Section? Did you know that both Melanie Oudin and Devin Britton played USTA Jr. Team Tennis?